Eagle transporter - now 1:48 scale! Based on the miniature used for Season 1 of Space: 1999. Includes spring-loaded landing foot pads, pilot figures, and all decals needed. Skill level 2 model kit measures 22-inches long! 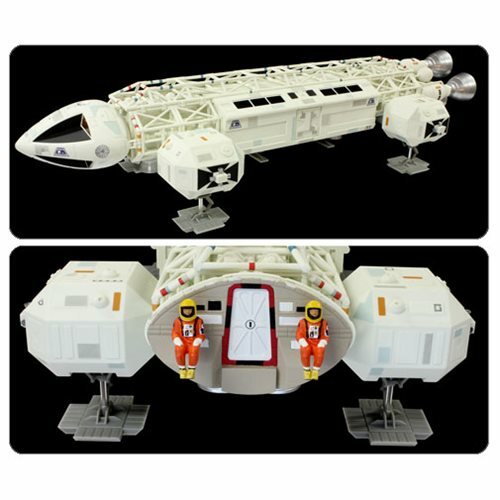 Based on the 44-inch miniature used for filming Season 1 of Gerry Anderson's Space: 1999 sci-fi TV series, this exciting Eagle transporter is scaled down to measure about 22-inches long when fully assembled. Exhaustively researched for accuracy, its nearly 300 parts include spring-loaded landing foot pads, pilot figures, and all decals needed to decorate the ship. Molded in white and clear, it's a skill level 2 kit that requires glue and paint (not included). Skill level 2. Ages 10 and up.